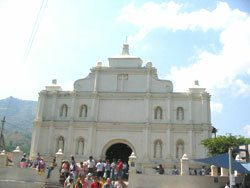 Panchimalco is the closest colonial city to San Salvador at only 15 km to the South East and at 575 m ASL. 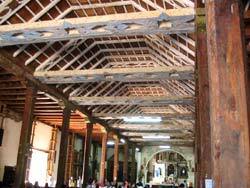 The church is a jewel of architecture, built more than 200 years ago. Panchimalco's population is pre-Columbian and its name means place of "flags and shields". 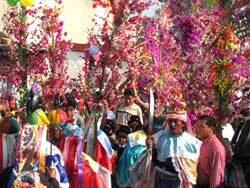 The town celebrates its patron saint festivities in honor of Señor de la Santa Cruz de Roma on September 13 - 14th. The Casa de Cultura (house of culture) is doing an excellent job in rescuing the traditions and local handcrafts, such as folkloric dances and the typical clothes of the "Panchas" (local women of Panchimalco), Procession of Palms (during the first week of May). 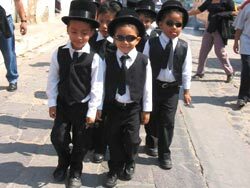 The procession is one of the main attractions of Panchimalco. 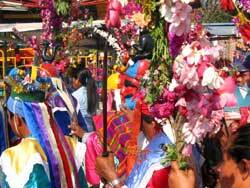 During the celebration, indigenous people offer goods to the god "xipe-totec" in order to get good crops/harvest. Then the drink "chicha" is offered to the crowd, (chicha is a fermented alcoholic drink made of corn and dulce de panela); and also the "historiantes" dance. One of the main reasons why Panchimalco doesn't have any archaeological remains is the amount of catastrophes it's seen; such as: earthquakes and hurricanes (which have actually caused most of the damage). The rain storm of San Dionisio, in October 1762, led to the cracking of hill El Chulo (Puerta del Diablo). The whole rock formation broke into three, and opened a view to the eastern part of the country and setting the environment for numerous stories and legends. More recently in 1906 a similar tragedy occurred.